Photo by Bijan Amini-Alavijeh, courtesy of the artist. Leeds was kicking up a (literal) storm the evening I went to view Lisa Marie Dickinson’s exhibition Mother Tongue. There were old newspapers swirling round this newly gentrified end of town, and in doorways many people took shelter, some of whom likely did not have a secure home for the night. In the peace and well-lit calm of Serf’s project space, Dickinson, a textiles graduate, tells me about her long-term relationship with language and identity, that is, with her Mother Tongue. Words, she says, course through her head. She captures them on her phone when she can and later, reading back, find she has made unfamiliar and highly abstracted short stories. As reader of her own words they become different. So what might an audience think if these words were abstracted further, constructed as sculpture, hidden in textiles? What or who is the backwards word sculpture gni? Through a mirror it reads …ing. Dickinson lives her life in red, black and white. This is her colour palette and her personal imprint: the red lips, the black bob, the white surface waiting to be marked. Numbered one to twelve, Dickinson’s pieces sit in the project space with a cheeky and provocative confidence that belies their modest media. Reversed letters formed from clay, tiny curtain tassels peeking over wooden beams — a reminder of Dickinson’s textile past — seem oddly disembodied here. A small sketch in red and black pastel of her favourite outfit greets the viewer on entry. Later, reaching the end of the exhibition, two more sketches stand adjacent behind an emulsioned mdf screen bearing the deconstructed marks of written text, their little heads together, discussing us with a cheerful irreverence. There is a tiny maquette that never became a fully formed sculpture and does not mind who knows it. Instead it has become what Dickinson describes as an ‘object as vessel of communication’. A cut-out bird perches atop. The centre of the exhibition is a symbolically red circular piece: an abstracted eye peering back at us from an almost cosmic centre. My lips, your lips, the artist’s lips? A tumbling textile and a lacquered screen both bear the marks of abstracted language. Dickinson turns her words into a 3D manifestation but always relies on and remains faithful to drawing and mark making. From modest media comes personal documentation, language dissection, comments on the body and identity. If we were pared down as human being as much as we can pare down language, would our marks and signifiers still be recognisable to our loved ones, to ourselves? What would strangers make of us? If we slip behind Dickinson’s screen might we emerge differently? 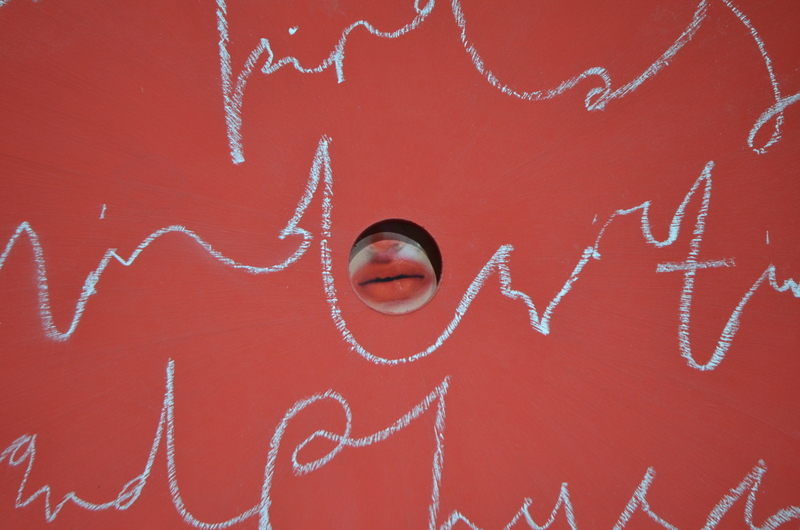 My final encounter is with a clay and spray-paint sculpture of the word and. A good word to end on…? Outside the threatened storm is growing wings. I am propelled to the train station. There are more figures than before seeking shelter and the sky can only be described as yellow. Mother Tongue, serf, Leeds, 13 October to 23 October 2017.